Get off the treadmill and out of the gym, New Yorkers! With spacious parks, stunning waterfronts and beautiful beaches, the city has plenty of scenic running routes to explore. Whether you're stretching those limbs after a particularly gruesome winter or want to take in beautiful fall foliage while getting fit, these five running routes are so pretty you won't be paying attention to those burning muscles. What to see: This is truly a postcard-worthy route. 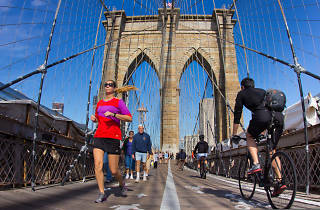 You may want to bring your phone along with you to snap pictures of the Manhattan skyline as you run over both bridges. You can also see the stacked highways near Brooklyn Bridge Park and hear the clatter of running on wood planks. When to go: To avoid midday tourists, head out early or at night. Who it’s good for: Newbies and intermediate runners. Be warned—on the bridges you may feel as if you're running up a hill at certain points. What to see: Running along the West Side Highway, you can see views of the New Jersey skyline and the Freedom Tower as you head south. As you round the tip of Manhattan, catch the stunning landscape of the Statue of Liberty, Staten Island Ferry, South Street Seaport and Governors Island. Along the east side you get to take in the Brooklyn, Manhattan and Williamsburg Bridges before heading back to Houston Street to finish your run. When to go: Go during the evening or early morning to see the sunset or sunrise. What to see: Although this is a fairly short run, you'll get to see a lot of major New York attractions. You can hear the animals from the Queens Zoo, run past the Hall of Science and Queens Art Museum, Arthur Ashe Stadium and catch glimpses of Citi Field. Best of all, the famous discs left over from the World's Fair and the Unisphere are along the route. When to go: A daytime run is best to see all the sights. What to see: You'll feel like you're deep in the woods despite being in the middle of the Bronx with access to public transportation. Dirt trails wind through Vault Hill and lead to a bridge over the Henry Hudson Parkway, into the Northwest Hills and past the riding stables. Reward yourself at the end of the loop with a piece of the famous Lloyd's Carrot Cake. Where: Start at either end of the boardwalk. What to see: Get a beach run without ever leaving the city. The boardwalk (2.5 miles long) stretches along the waterfront, giving you bay views as you run back and forth from Miller Field to the base of the Verrazano-Narrows Bridge. When to go: A midday run means you can relax on the sand afterward.